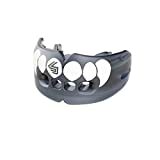 The Venum Challenger is a really great mouth guard, it’s nicely designed specifically for Boxing, Karate and MMA athletes in collaboration with leading professional competitors to allow easy breathing and sturdy enough to protect your teeth from hard jabs. The nicely rounded and compact front design with a fantastic breathing channel mean that you won’t be struggling to catch a breath during the big fight (at least not due to the guard). That coupled with the Nextfit gel makes for a really comfortable piece of equipment to wear, plus it fits snugly once you boil and fit it so you wont have to worry about it slipping off mid fight. The high density rubber and cutting edge design deflect the force of impact away from your front teeth and evenly redistributes it along the length of the guard towards your stronger, more sturdy back teeth thereby resulting in a very good level of protection not only for your teeth but also for your gums, lips and jaw too. It’s reassuring to see the product packaged in a nice sanitary case rather than some dubious looking plastic packet, thoughtlessly stuffed into a bag. The high density rubber and cutting edge design deflect the force of impact away from your front teeth and evenly redistributes it along the length of the guard towards your stronger, more sturdy back teeth thereby resulting in a very good level of protection not only for your teeth but also for your gums, lips and jaw too. It’s reassuring to see the product packaged in a nice sanitary case rather than some dubious looking plastic packet, thoughtlessly stuffed into a non fitting case. Available in a range of colors, both internal and external to suit your own personal tastes and indented with the quality Venum logo this is a really nice piece of kit. 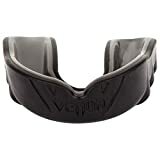 Ultimately I would recommend this mouth guard to anyone up to a middleweight to super middleweight, as it’s a fairly lightweight mouth gard if you’re competing above that weight you may wish to go for something more heavy duty, but for most other applications this product is more than adequate. All in all this is definitely one of the better mouth gards I have uses and I would highly recommend this product. The Gladiour is a really nice, solid mouthguard that is comfortable to wear and provides great protection during your matches. A relatively new manufacturer Gladiour is forging its reputation for providing high quality, long lasting sports equipment and if this mouth guard is anything to go by they will be a serious contender in the near future. This mouth guard has a great compact and slim, lightweight design making wearing it much more comfortable than some of the bulkier mouth guards on the market. It has a great tight fit after boiling and won’t slip during the big fight providing superior protection. Designed specifically for full contact sports such as Boxing and MMA this mouth guard provides superior protection for your teeth without compromising on comfort and ease of use. The impressive breathing vents provide a spectacularly good airflow making breathing that much easier during an intense match. Made out of high-quality durable material this product is sure to last a considerable length of time before it has to be replaced. This is doubly ensured by Gladiour’s remarkable 6 month replacement guarantee to give you great peace of mind. The case is nice and hygienic making it suitable to throw into your gym bag before you head off. All in all this is a great mouth guard suitable for anyone up to a middleweight boxer, if you’re competing above that you may require something less lightweight, but for other applications it’s fantastic. I would recommend this to anyone looking for a good quality, comfortable mouth guard that still provides great protection. It has a great tight fit after boiling and won’t slip during the big fight providing superior protection. 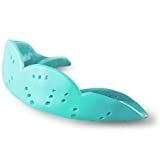 Designed specifically for full contact sports such as Boxing and MMA this mouth guard provides superior protection for your teeth without compromising on comfort and ease of use. The impressive breathing vents provide a spectacularly good airflow making breathing that much easier during an intense match. Made out of high-quality durable material this product is sure to last a considerable length of time before it has to be replaced. This is doubly ensured by Gladiour’s remarkable 6 month replacement guarantee to give you great peace of mind. The case is nice and hygienic making it suitable to throw into your gym bag before you head off. All in all this is a great mouth guard suitable for anyone up to a middleweight boxer, if you’re competing above that you may require something less lightweight, but for other applications it’s fantastic. 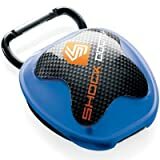 I would recommend this to anyone looking for a good quality, comfortable mouth guard that still provides great protection. This is doubly ensured by Gladiour’s remarkable 6 month replacement guarantee to give you great peace of mind. The case is nice and hygienic making it suitable to throw into your gym bag before you head off. All in all this is a great mouth guard suitable for anyone up to a middleweight boxer, if you’re competing above that you may require something less lightweight, but for other applications it’s fantastic. 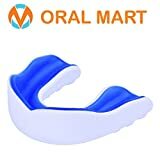 I would recommend this to anyone looking for a good quality, comfortable mouth guard that still provides great protection. Suddora have long been known for producing fantastic, high-quality mouth guards suitable for both children and adults. This mouth guard is incredibly easy to mould and after boiling retains its shape excellently. The superior fit results in an incredibly comfortable and lightweight guard that wont cause any irritation to your gums and lips like some other bulkier guards might. The lightweight material fits snugly and ensures a great level of protection while you’re in the ring. This particular guard is also very easy to convert for children providing a great level of protection for all the youth boxers out there, this also means that the guard is very easy to adjust for individuals with a smaller mouth, for whom finding a well fitting mouth guard can be problematic. The case provided is good and durable and has good ventilation allowing the mouth guard to dry effectively when not in use resulting in a much more hygienic product. Made from high quality POE material and fully safety tested this product is suitable for all athletics applications. The added grip rings on the base of the guard result in a great fit that won’t slip or slide during contact sports making this an ideal choice for boxing or karate. Available in pretty much any color you can think of this product is sure to suit your own personal tastes and needs. Given that this is a very lightweight guard I would recommend for boxers up to around the middleweight category. This really is a great product and provides great value for money without compromising on protection and comfort and is probably one of the best kids guards available on the market right now. The Nike Max Intake truly is an exceptional mouth guard, very comfortable, very durable and offers spectacular protection. The Max Intake features a really nice dual density construction making it extremely comfortable to wear in any sporting situation, soft enough to prevent irritation to your teeth and gums but still sturdy and strong enough to protect them from the most forceful of impacts. Nike’s patented O-flow technology means that you won’t struggle to breath while wearing it, even in the most spirited of fights or in grappling situations. The strength of this guard does a stunning job of protecting your front teeth from hard impact punches distributing the force really well. The guard comes with a string attachment if you wish to connect it to any headgear you may be using which is a really nice feature. After doing the whole ‘boil and bite’ customizing this guard fits the average sized mouth spectacularly and stays that way throughout use, it even comes with a little instrument to help with that process. There is very little slippage while using this guard, it stays firmly and securely in place which is a great bonus, having one less thing to worry about during your match. The Nike Max Intake is available in a good selection of colors to suit whatever style you prefer, all of which are ingrained with the classic Nike logo like a badge of quality. My only criticism about this guard is that it doesn’t come with a case, not a big deal as you can easily purchase one but it would have been nice to have a matching one supplied with it. All in all it’s a very good, strong guard capable of standing up to some pretty forceful impacts without being uncomfortable to wear. Out of all the products, this could be one of the top boxing mouth guards. I would recommend this to anybody looking for a great quality guard up to a middleweight and, because of its great construction, maybe a little over before you’re going to need a more heavy duty guard. Shock Doctor is a big name in the boxing and MMA scene and with products like this it’s easy to see why. This is a superb piece of sports engineering providing great comfort and protection with a sleek, stylish and serious understated appearance. The dual composite construction results in far superior protection and comfort than other guards making is comfortable enough to wear in any sporting situation without causing irritation but still providing enough protection to ensure that your teeth aren’t going to sustain any damage if you take a few punches. The internal shock absorbing frame redistributes the force of the impact from your more vulnerable front teeth and dispersing the shock towards your stronger and more sturdy back teeth spreading the force of the impact. With the incredibly simple boil and bite system this guard will feel as though it has been custom made for you personally, no slippage and great grip during matches. This guard is also suitable for people who wear braces which is a really great feature as it can be extremely difficult to find a good quality mouthguard that is also suitable for braces wearers. My only criticism of this mouthguard is that it isn’t supplied with a case, Shock Doctor do sell very good antibacterial mouthguard cases though so it may be advisable to pick one of those up at the same time. Ultimately this is a great mouthguard and infinitely preferable to a huge dental bill or damaged teeth, probably one of the best available on the market right now and is spectacular value for money, even if you have to purchase a separate case for it. This is without a doubt the best mouth guard for boxing. I would definitely recommend this guard for anyone looking to get into boxing in a serious way and who are looking for a product that is not only extremely protective but also very comfortable to wear. SUPERIOR QUALITY - Our dual-layer sports mouth guards give you the best customized fit (Inner Gel Layer) and the most superior impact resistance (Outer Impact layer). Not all dual-layer mouth guards are the same and you may not be able to tell the difference by appearance until you try it. More than that, we provide you 8 most popular colors for you to choose from. Lastly, each Oral Mart sports mouth guard comes with a FREE vented case for your convenience. Ortho-Channel provides structure that improves breathing.